Nardo di Cione (Italian, ca. 1320–1365 or 1366), Madonna and Child, ca. 1350. Tempera and gold leaf on panel. 29 1/2 x 19 in. (74.93 x 48.26 cm). Milwaukee Art Museum, Purchase, Myron and Elizabeth P. Laskin Fund, Marjorie Tiefenthaler Bequest, Friends of Art, and Fine Arts Society; and funds from Helen Peter Love, Chapman Foundation, Mr. and Mrs. James K. Heller, Joseph Johnson Charitable Trust, the A. D. Robertson Family, Mr. and Mrs. Donald S. Buzard, the Frederick F. Hansen Family, Dr. and Mrs. Richard Fritz, and June Burke Hansen; with additional support from Dr. and Mrs. Alfred Bader, Dr. Warren Gilson, Mrs. Edward T. Tal, Mr. and Mrs. Richard B. Flagg, Mr. and Mrs. William D. Vogel, Mrs. William D. Kyle, Sr., L. B. Smith, Mrs. Malcolm K. Whyte, Bequest of Catherine Jean Quirk, Mrs. Charles E. Sorenson, Mr. William Stiefel, and Mrs. Adelaide Ott Hayes, by exchange. As Christmas approaches, it seems appropriate to take a closer look at one of the highlights of the European galleries: Virgin and Child by Nardo di Cione (Italian, ca. 1320–1365 or 1366) in Gallery #4. Nardo was one of three artist brothers with a workshop in Florence in the mid 14th century. They were well-known not only for church frescos, such as those in the Santa Maria Novella, but also their free-standing panel paintings. In the years before Nardo and his brothers opened their workshop, the Italian artist Giotto (1267-1337) had become known for the revolutionary style that developed into the hallmark of the Renaissance. Giotto attempted to depict the world more realistically, using gentle shading in his figures to show depth of space, making them interact and show emotion while in recognizable settings. A perfect example is the Lamentation of Christ in the Arena Chapel in Padua dated to 1305-1306. This was in direct contrast the Byzantine style which had been used during the middle ages: stiff, flat figures were shown frontally and arranged in a strict hierarchy within an amorphous space, such as this example at the Metropolitan Museum of Art. 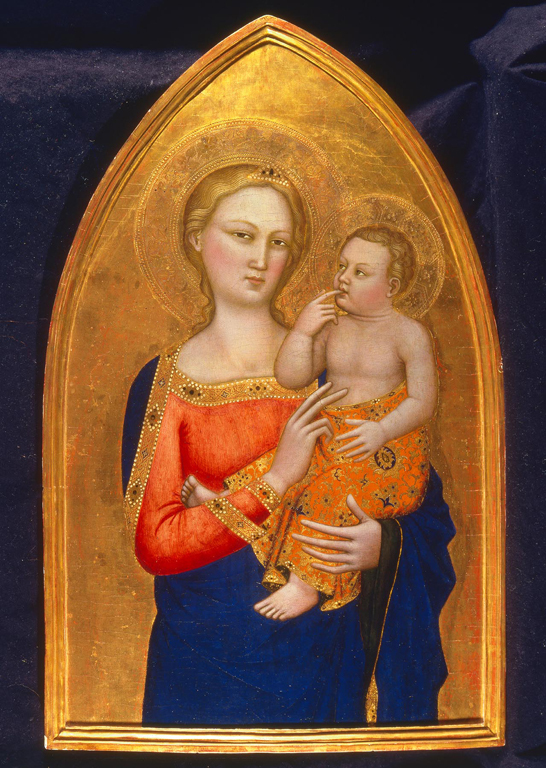 Because Giotto worked in the same city as Nardo, we would expect to see his influence in Virgin and Child. And we do, in the delicately modeled head and hands of the figures, the thoughtful expression of the virgin, and the loving exchange between mother and child. In particular, Jesus is shown as a real baby, focused on his mother with his finger in his mouth, not as the all-knowing mini-adult of earlier art. But at the same time, there is also a reversion to the Byzantine style. The decorative banding of the figures’ drapery and the overall pattern of Jesus’s fabric flatten the bodies, while the gold background shimmers without a hint of location or context. In fact, their halos are not separate from the background, but are part of it, suggesting that they are in a heavenly realm. Why is Nardo looking back to earlier artistic styles instead of forward to the developments of the Renaissance? The answer becomes clear when you find out what was happening in Florence around 1350, when Nardo painted this work. In 1348, the bubonic plague which had been ravaging Europe swept into Florence, killing as much as half of the population in less than a year. The citizens, reeling from the horror, saw it as a judgment upon the recent changes in social, economic, and artistic ideas. To find comfort and stabilization, they returned to what had come before. Nardo di Cione’s career was at its height during this resurgence in traditionalism, and so Virgin and Child reflects that historical reality. In this unique historical setting, Nardo produced a panel that combines the rich colors and magical world of the Byzantine style with three-dimensional figures that are imbued with humanity. The quiet yet imposing beauty of the painting, which was most likely made as the center panel of a small folding altarpiece, and would have been used for private devotion by a wealthy 14th century Italian patron. The patron spared no expense with rich materials, which also reflect glory upon virgin and child. The virgin is shown as the Queen of Heaven in her blue robe of expensive pigment made from lapis lazuli, a rare stone imported from Afghanistan, which was reserved for royalty. All of the gold in the painting is real gold leaf. The indentations in the panel that form the halos were originally studded with jewels, now lost to the passage of time. In contrast to the luxurious details, however, the simple composition of the painting–with the virgin looking out at the viewer, touching her son’s chest with a gentle gesture of blessing, to show that her baby son is the way to salvation–certainly would have been a reassuring spiritual reminder to the painting’s owner. Knowing the historical context of this important and beautiful painting of the early Renaissance, the viewer can be reminded that we should not take love, health, and comfort for granted. Best wishes for the holiday season! It’s true that Nardo di Cione’s lyricism enters into the work (and individualizes it). After a conversation about the Neopolitan Creche at the Art Museum recently, Catherine Sawinski showed us this Madonna and Child and explained its history, and I can truly say that its splendor can only be entirely noted in its presence, the gold leaf being particularly stunning, and a spirituality that is uplifting emanating radiantly from its presence. Thank you for the research (this glory in stark contrast to the Bubonic Plague) and the review.